There’s good news for Dublin ladies football as Gregory McGonigle looks set to remain in charge next year. Dublin ladies senior football team manager Gregory McGonigle. HE MAY HAVE suffered his fourth TG4 All-Ireland ladies senior football final defeat against Cork on Sunday but Gregory McGonigle will keep on going until he cracks the Rebel code. The Derry native was manager of Monaghan in 2011 and 2013 when they lost to the Leesiders and he’s been Dublin boss for the 2014 and 2015 defeats. McGonigle’s been there or thereabouts on each occasion as Cork’s aggregate winning margin across the four deciders is just six points. And McGonigle is hellbent on getting one over on Eamonn Ryan’s all-conquering Rebelettes. “Obviously we’d admire what they have done for ladies football, it’s to be commended,” he said. “Listen, we have to beat somebody some day in the final, Dublin have to beat somebody some day and we know it’s going to be Cork. A determined McGonigle then revealed his desire to remain in charge of the Jackies for the 2016 campaign. “When I agreed to take the Dublin job, it was a one year term and they announced it as two. “They’re a fantastic bunch of players. I’d love to be back in Dublin next year, we’ve a fantastic management team, great atmosphere and great bond with the players. “We’ll sit down with the county board in a week or so and review the year. 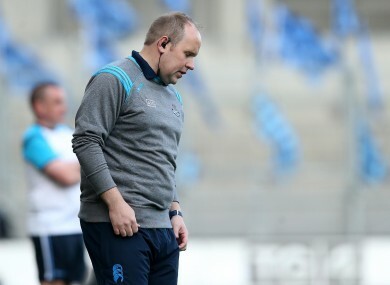 On Sunday, Dublin lost by two points to Cork and McGonigle admitted that the 2014 final defeat, when a ten-point lead was coughed up in the final 20 minutes, was “more devastating” in terms of impact. “Last year was possibly more devastating, you’ve been in the lead and lost it. “But we have 17 players out of the 27 that are 20 years of age or younger. Email “'Dublin are in a very strong place, we just hope we're a part of it again next year'”. Feedback on “'Dublin are in a very strong place, we just hope we're a part of it again next year'”.